We are aboard R/V Revelle and deploying our first of 12 moorings. We're mapping the deep flow pathways of Antarctic water as it makes it way north along the Pacific seafloor (5.5 km down). We are investigating the turbulence and hydraulics of the flow, too, as it squeezes through the narrow constriction of the Samoan Passage. Our tools include a CTD with a temperature/conductivity microstructure package, a powered lowered ADCP with real-time data up the wire, and a turbulence profiler. We have a great science party, a great ship with a great crew, and great weather so far. Wish us luck, and follow our blog. Also check out the Revelle's latest deck camera to see what we're up to. 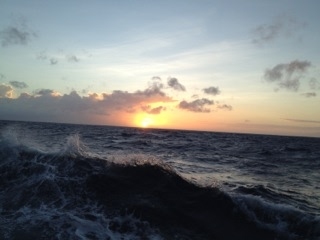 Sunrise at 8S, north of Apia en route to the Samoan Passage.